Best Banh Mi Saigon : Which Banh Mi Restaurant in Ho Chi Minh City serves the best Banh Mi Saigon? Fulfill all your Parts Unknown Fantasies! Our two guides (plus one photographer) had everything down like professional clockwork. They knew the history of each dish, the ingredients, the preparation, the cultural influences, and exactly how to savor each morsel to the fullest. Highlights: the jungle vegetable wraps, and the fresh seafood venue (where they also had us try the embryonic chicken). We did the “chef’s tour” but crossed paths w the regular tour at dessert, and they all had every bit as much fun that we did! I’ve been on food tours in San Francisco, Seattle, Hong Kong, NYC, and LA. This ranks up there. It’s not so much of a morsel-costco-aisle-sampler tour, but more of a full full sit-down meal each time that you are forced to abandon, only because it’s time to move on to the next stop. Of course it starts with the “Obama noodles,” made famous by Obama and Bourdain in Hanoi, and ends with the best Banh Mi and transcendent ice creams you’ll ever have. Along the way there are stops at a seafood smorgasboard, a veggie extravaganza with greens that explode with flavor like a drug induced experience that will literally awaken your tastebuds with newfound flavor, and a Chinese-Frmch-Vietnamese influenced bowl of noodles that rivals the most sublime ramen experience I’ve ever had in regards to a broth of depth and savory beef fattiness. If you already know that backstreets are where the gems are, each scooter ride through tiny back alleys that open up into a locals only mini-plaza of single-item food stalls, will fill you with anticipation... several times over the coarse of one admittedly exhausting night. Not to miss! Best culinary experience I've ever had I booked a private Chef tour for myself and my girlfriend and both of us had one of the most incredible travel experiences of our lives. We're both US based, and very well traveled, and I cannot think of a better one at this present moment. Quyen and Ky were incredibly knowledgeable and friendly, and safely got us to 8 different vendors around Saigon. I'm personally not much of a review writer, but we had such an incredible experience that I feel obligated to share with the community just how special this trip was. My personal favorite was the classic banh mi from a small food cart that 99% of the population would walk right by - the fresh baguettes and bbq pork were incredible. Beyond the banh mi, we enjoyed a truly diverse menu that showcased the many great flavors and dishes of Vietnam.You'd be crazy not to book this. Bonus points if you can work with either Ky or Quyen, but I'm sure there are other great team members at Back of the Bike if you can't. Exhilarating!!! We were picked up from our hotel by a couple of very friendly drivers. We were then in amongst the hustle & bustle of the busy streets. At our first stop we enjoyed street food delight of beef salad. Then on to the next street food experience, where we enjoyed bahn mi (I think that's what it was called) a baguette stuffed quail meat a vegetables - delicious. Then on to the next street food experience buzzing through the traffic. Here we had the opportunity to actually cook the food. I made pancakes with pork & prawns - so much fun. All the way we had a photographer which I thought was going to be a marketing ploy to get us to buy photos! But, no - the photos were sent to us via email - awesome!Not once did we feel unsafe on the back of the bike as our drivers were exceptional. Would highly recommend that you put this on your 'must do' list. Fantastic night zooming around Saigon Bike of the bike tours was an awesome way to finish our trip in Vietnam. Could not speak more highly of Jake and Trang who drove myself and my sister around for the night. They were so knowledgeable, fun and our safety was always top priority. When my sister couldn't eat the spicy food, they went out of their way to bring her a delicious Banh Mi. I would recommend to anyone looking to do something a bit different and see the different districts! Great night. Thrilling, tasty way to take in Saigon The girlfriend and I did the evening street food tour. Our guides - Truc and Dung (both ladies) were very polite and attentive from the moment they picked us up from our hotel. The tour itself was superb - great food and very well organized. Ie when we arrived at each of our food stops the tables were already set up for us to crack on with the eating! The guides demonstrates that they would really go out of their way to help us. For example, we mentioned that we wanted to try an authentic banh mi (Vietnamese baguette) and they arranged for one to be delivered to us at the end of the tour - awesome! I highly recommend this tour for seeing so much of Saigon and sampling great food. As a lady, my girlfriend felt safe and at ease. Well worth the price We were a bit apprehensive of shelling out $64 for a street food night tour that we thought we could do ourselves. Other than the delicious food, it's a great way to get around Saigon and get your feet wet in their vibrant culture.We expected to eat great food, and we were served excellent meals in restaurants without any tourists. We had a reserved table even in the most crowded/popular food places and had free drinks and wet towels. Our guides were college kids who are very good in English. We were 6-7 tourists in the group with one guide/driver each. Other guides were also present either as additional companion, coordinator, or photographer. They really take time to converse with guests, even during driving! They had a photographer to take photos of us so we didn't have to bother pulling our camera out from time to time. Our guides gave us tips on where to go, what to do, and a map with the best places to eat in Saigon. We followed their recommendation on the best banh mi in the city and still think about it to this day. If you will be staying in HCMC for a couple of days, we definitely recommend doing this tour on your first night.My only recommendation is to let the guides wear name tags since Vietnamese names are pretty difficult to say for most people. Other than that, I genuinely had a great time. The excellent food, great company, and awesome sights make the experience well worth the price. The Banh Mi has become a Phenomenon across the globe over the last few years. In London alone, you can find approximately 26 shops selling their own versions of the Banh Mi for 4-6 on average. America is being swept up by its own wave of Banh Mi enthusiasts who are not even blinking while shelling out an expected $6 dollars for a quality Banh Mi. What is it that makes the Banh Mi so fantastic that its notoriety is spreading across the world so quickly? As a cook and foodie, I appreciate the balance of the sandwich. It touches every sensation on my tongue perfectly and leaves nothing more to be desired from such a humble and simple sandwich. Layered with meat, smothered in pate and mayo, and topped with fresh herbs, pickles, and chili creates a texture and flavor party that leaves the masses standing in line with their hands open begging for more night after night in Saigon. The Saigon Banh Mi is a special type of bread that is unique and different from a standard French Baguette you might find at a French bakery. Not only used for sandwiches, the Banh Mi has found its way onto many different Vietnamese dishes as a necessary side. One of the most notable being the French influenced Vietnamese dish Bo Kho, which requires the Banh Mi for soaking up the meaty rich broth making for an excellent breakfast. A very popular Goat Curry restaurant in Saigon, provides its guests with a stack of Banh Mi at each table used to soak up the rich curry gravy which provides a unique substitute to the Naan Bread that is typically placed alongside curry dishes. The bread itself is much debated online in various forums given to the difficulty for finding a legitimate recipe that uses Rice Flour to create the Banh Mi. The complexity comes from the nature of Rice flour not containing any of the necessary proteins that help create gluten which assists the leavening agents to capture pockets of gas. Also that rice flour, depending much on the granule size of the flour itself, is slower to absorb liquids than wheat flour but will also absorb more liquid. This is a mystery that should be left to solve with someone that has an oven inside of their apartment, which would not be me at the time of this article. Is the best Saigon Banh Mi the only sandwich we need to eat in Vietnam? 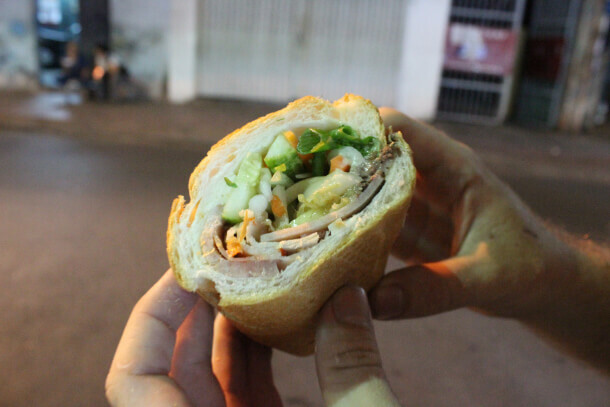 The Banh Mi sandwich has very different forms depending on where you are in Vietnam. There is the Infamous Banh Mi of Hoi An that was visited by Anthony Bourdain. This Banh mi is dubbed the “Deluxe” and along with fresh salad, pickles, and 4 types of pork is topped with a fried egg. Just a little bit up the road in Da Nang, you can find a specialty in the dehydrated pulled chicken sandwich called Banh Mi Ga. In Hanoi, you can find a grilled pork in a spicy sauce with fresh vegetables. Other variations found all over Vietnam include Fish sauce marinated grilled pork, Grilled Pork Patties with a sweet sauce, Meatballs in tomato sauce, and a morning favorite of fried egg. These are just a few of the variations, not even mentioning what foreign chefs and cooks are now doing with the humble Banh Mi. At Banh Mi Huynh Hoa located at 26 Le Thi Rieng, There are two carts stacked with 9 different types of meat, fresh pate, and homemade mayo pushed up against the right wall of the building. On the left side, there will be a man who is constantly heating up baguettes inside of a low heat oven. Depending on the time that you have chosen to get the best Banh Mi Saigon, there will be a mob standing on the outside of the store, which is helpful in identifying the shop if you are not familiar with Ho Chi Minh City. You want the best Banh Mi in Saigon? You are going to have to get through the mob. Now, don’t be intimidated or offended by people cutting in front of you and ignoring you when you enter the mob. This is just Darwin’s Theory at work, only the strong will get a sandwich!! Politely, but confidently push your way to the front as you feel that your turn is coming. The Banh Mi maker will be slathering bread and placing meat onto sandwiches at the speed of light. When it comes your time to order, be ready! Just use your fingers to indicate how many sandwiches you want. This lady is busy and has no time to provide excellent customer service. The Best Banh Mi in Saigon will do that for them. If she asks a question just shake your head “Yes”. Most likely she asked if you want Chili or not. The sandwich is now getting made! Get excited! The Banh Mi will be passed down the line to be finished with pickles and vegetables. It will then be passed to a man who stands on the left side of the first sandwich maker. This will be the man you will pay. Vietnam is not the easiest place for travelers especially when trying to experience it like a local. You just located and purchased the best Banh Mi Saigon without speaking any Vietnamese, Well done! Now please enjoy! What is in the best banh mi Saigon? I thought you might be curious on what you now have holding in your hand. This is a Banh Mi Thit, which translates into Wheat Bread Meat Sandwich. 6 types of deli meat made from pork, with ranging textures. Some are smooth like Bologna and others chunky like head cheese with lots of fat. Well, that covers the best Banh Mi Saigon in our opinion. If you disagree, please let us know. We want to hear what your favorite is! If you are interested in Vietnam Food Tours then be sure to check out our Saigon Food Tour, if you are looking to check out the Best Banh Mi Saigon then ask about our private tours and chefs tours! Hey Fred! New in town, just moved here. Thanks for the recommendation, just ate it and my tummy is delightfully at ease. Any ideas on the best Pho in HCM? Thanks!